During the time I spent at Acadia, the main road into Bar Harbor, ME was undergoing repair and repaving. It became a temporary one-way street, with a major detour through the park when one wanted to go the other way. Traffic was severely congested, and parking a nightmare. I only went into town once and that was enough. Bar Harbor is well known as the place where the rich and famous live or spend their summer. In the fall of 1947 a giant fire was fanned by wind and lasted more than a month. It completely burned many cottages, hotels, and over 10,000 acres (4,000 ha) of Acadia National Park. Regrowth of the forests occurred naturally, and it is said that the park looks better now because of the fire. 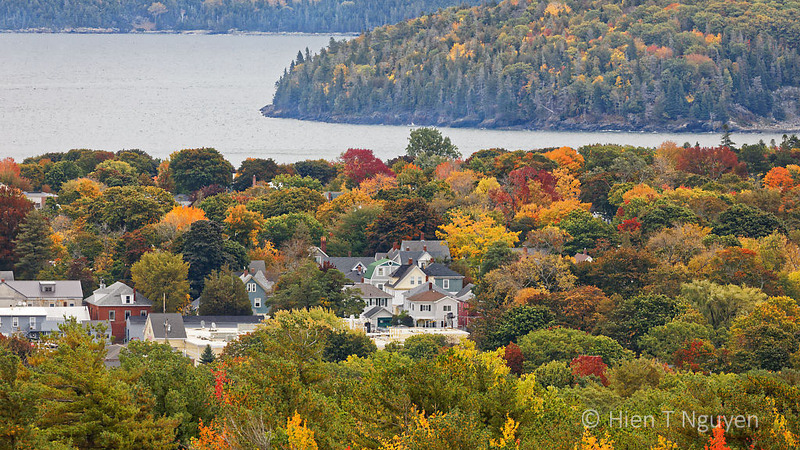 Here’s a view of a part of Bar Harbor from Park Loop Road above it. 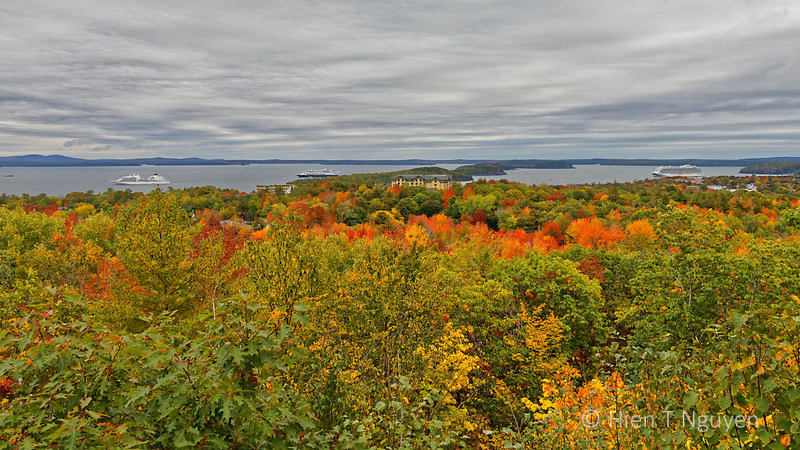 View of Bar Harbor from Park Loop Road. 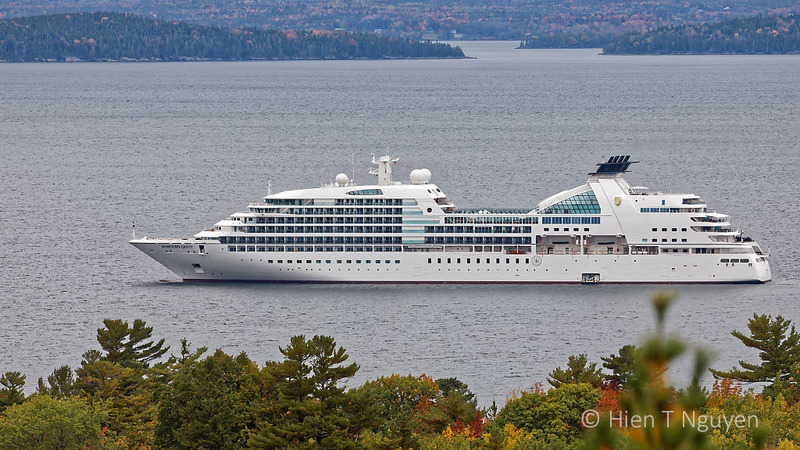 In this next shot, you can see three cruise ships anchored along Bar Harbor water front. 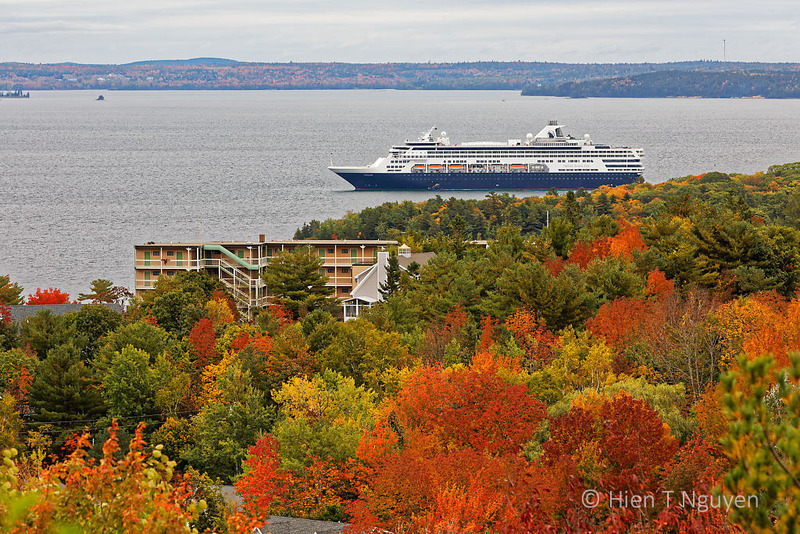 View of Bar Harbor from Park Loop Road with cruise ships anchored in the distance. Cruise ship at Bar Harbor. There is currently no pier or terminal for the cruise ships, and small boats are used to ferry their passengers to Bar Harbor and back. The town expects 230,000 cruise ship passengers in 2018, a 257 per cent increase from 2003. 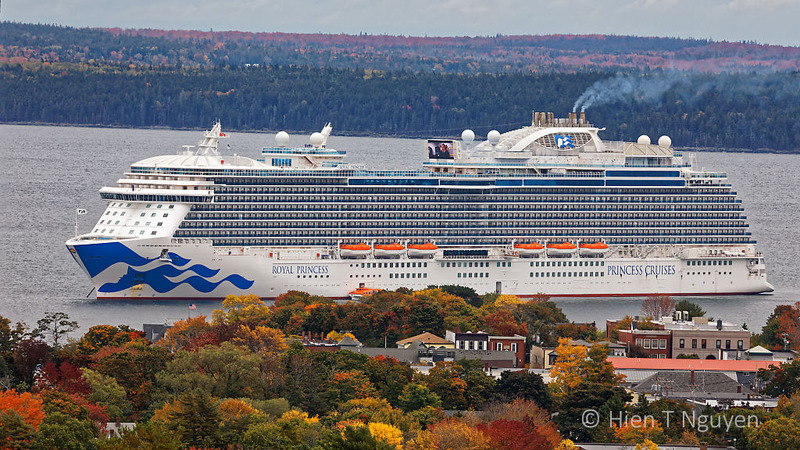 In the fall, one big cruise ship alone can disgorge as many as 6,000 passengers into Bar Harbor, which had a total population of 5,434 in 2017. Naturally, the natives are grumbling! Although the tourist season has been extended and benefits business as a result, issues about congestion, pollution, and quality of life have been raised. A recent proposal to build a terminal for cruise ships has met with local opposition and it may never be built.